Consuming less electricity, Turntable Stretch Wrap Machines manufactured by Durapak are domestically and internationally popular as the best stretch wrappers. 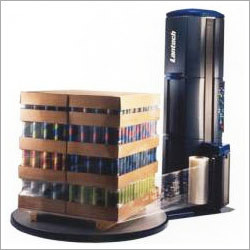 These Stretch Wrap Machines are used for wrapping relative quantity of all pallet loads. Ideal for Turntable Stretch Wrapping, our equipment are simply perfect for semi-automatic conditions since the machinery can be loaded with a fork truck or pallet jack. Offered in the option of low profile and high profile, the machines are assured of low maintenance cost and high efficiency. The High Profile Turntable Stretch Wrapping Machines are simply perfect for forklift loaded applications. This type of Stretch Wrap Machines allows simple loading as well positioning access. Also, it can handle oversized loads eliminating the need of dragging them on the frame. The machinery is based on latest technology and delivers optimum performance in all working environments.